LED is the common abbreviation for a light-emitting diode. Each individual LED consists of a semiconductor diode that emits light when a voltage is applied to it. The electronics industry has used LED technology since the 1960’s as indicator lights for various electronic devices. In recent years with the advancement in colour control and improved efficiency, LED technology has progressed to the point where it is viable for general lighting applications. LEDs began to be used in the lighting industry in the late 1990’s typically in aesthetic / speciality lighting applications, including architectural lighting. The use of LED luminaires in applications such as street lighting, area lighting, security lighting, and LED bulb or lamp retrofits is viable today both economically and from an illumination performance standpoint. Why can the lumen depreciation rate for an identical LED chip package vary between manufacturers? Unlike previous technologies, LED manufacturers have a much greater impact on the rate of lumen depreciation based on their luminaire designs. Thermal design and the installation temperature, play a critical role in the rate of lumen depreciation. Therefore you should see variation in lumen depreciation from manufacturer to manufacturer, as well as within different product families or across installations offered by the same manufacturer. What are the advantages to using LEDs? LEDs bring several advantages to the lighting industry, including high efficacy and durability, and, with superior life over other traditional lamp sources, their required maintenance is greatly reduced. This translates into energy savings, maintenance savings, and environmental sustainability. There is also the potential for greater optical control (more controllable source), dimming, instant on/off, and reduced rate of lumen depreciation (potential for long application life). Efficacy is a term normally used in cases where the input and output units differ. In lighting, we are concerned with the amount of light (in lumens) produced by a certain amount of electricity (in watts). Efficacy = Lumens Per Watt. Why are LEDs considered a ‘GREEN’ technology? LEDs are environmentally friendly on many fronts. First, unlike HID (High Intensity Discharge) lamps LEDs contain NO mercury. In addition, some LED luminaires are RoHS (Restriction of Hazardous Substances) compliant and have been designed to provide more than a decade of near maintenance-free service. That means no re-lamping, which means no waste. The metal halide’s lumen depreciation, as well as optical and ballast losses, quickly reduce output of the HID system. Note that there are three re-lamps over 60,000 hours. Conversely, LED has significantly better lumen maintenance, a more efficient electronic driver and doesn’t need re-lamping from zero to 60,000 hours. LED fixtures must be designed with junction temperature thermal management as a key component and use the correct LEDs. These products will then be robust enough to operate in most ambient temperature applications. Unlike fluorescent sources, cold temperatures actually improve the performance of LEDs rather than hindering them. What is the LED junction temperature? Junction temperature is the temperature at the point where an individual diode connects to its base. Maintaining a low junction temperature increases output and slows LED lumen depreciation. Junction temperature is a key metric for evaluating an LED product’s quality and ability to deliver long life. The three things affecting junction temperature are: drive current, thermal path, and ambient temperature. In general, the higher the drive current, the greater the heat generated at the die. Heat must be moved away from the die in order to maintain expected light output, life, and colour. The amount of heat that can be removed depends upon the ambient temperature and the design of the thermal path from the die to the surroundings. The LED’s life time, in terms of how quickly the brightness reduces and whether there is a colour shift, greatly depends on what temperature the LED operates at during it’s life. If an LED chip is run above the recommended operating temperature, it will exponentially reduce it’s lifetime causing it to loose brightness within months instead of years. 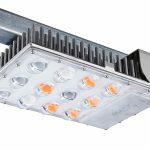 If an LED solution is properly designed, the LED chip will operate below the recommended operating temperature ensuring that the LED product meets or exceeds it’s quoted lifetime. An LED does not burn out like a standard lamp, so individual diodes do not need replacing. Instead, the diodes gradually reduce in brightness over a very long period of time. The life span of an LED is vastly longer than that of incandescent, fluorescent or HID lamp sources, generally lasting 50,000 hours or longer. Although the LED never really burns out, product life span is measured by lumen depreciation. The current standard for calculating the life of an LED is the point at which the LED reaches 30 percent lumen depreciation. 8 hours per day 34.2 years. What is the INDO Induction lamp system? The INDO Induction lamp system uses a revolutionary technology of light generation that combines the basic principles of induction and gas discharge. Void of electrodes this new technology delivers 60,000 hours of high quality white light. The system is comprised of three components; the generator, the power coupler and lamp. The power coupler transfers energy from the generator to the discharge inside the glass bulb using antennae that contain the induction coil and its ferrite core. The power coupler conducts heat through the mounting flange which allows the induction lamp system to be mechanically attached to the luminaire. INDO Lighting offers an amazing 60,000 hours lamp and ballast life, making it virtually maintenance free (6.8 years of continuous, or 15 years of night/day operation). It offers crisp white light with 80+ CRI and a choice of 2700K, 3500K, 4000K, 5000K and 6500K colour temperatures. The high CRI light makes colours look brighter, more vibrant and more attractive. It produces up to 150 perceived lumens of light for each watt of energy. This efficacy makes it as energy efficient as high CRI metal halide systems. Induction lamps offer high reliability and instant on and off. Do INDO Induction lamps need a dedicated fixture? Yes. INDO offers a range of fixtures designed specifically for our lamps, although it is sometimes possible to retrofit induction lighting if careful consideration is made towards the optical control and thermal management of the lamp. Can running a lamp interfere with computers or any other electronic device? No. INDO induction lamps comply with CE EMC regulations with non-interference under normal circumstances. Will the INDO Induction lighting system interfere with telecommunication equipment? No. INDO induction lamps comply with CE EMC regulations. The system will not interfere with radio equipment or mobile phones. Is the light output of an INDO Induction lamp affected by low temperatures? High temperatures? The lamp’s amalgam fill technology create stable light output over a wide range of ambient temperatures, maintaining at least 85% of nominal lumens from -34°C to 55°C (for an enclosed fixture with heat sink). INDO Induction lamps can start at temperatures as low as -40°C. Does operating position affect output? No. The universal operating position does not affect the performance of the induction lamp system. What is the colour shift of the INDO Induction lamp? The colour shift is very small over time. In new installations the colour may appear “pink” until the system stabilises and the mercury has vaporised. The light will change to a normal white colour within a few minutes. Is the INDO Induction lamp dimmable? Yes, the INDO induction lamp can be dimmed by up to 50%. Can the INDO Induction lamp system be used for a flashing beacon? Yes, we have a limited number of lamps which can be used for this application without impacting the system life. Is the INDO Induction lamp system vibration-resistant? Yes. The fact that INDO Induction lamps have no electrodes make them more reliable in high-vibration and gusty applications. The INDO Induction lamp system has proven its durability in bridges, tunnels, and signage applications. What, if any, is the effect of voltage supply fluctuations on the performance of the INDO system? Due to the built-in pre-conditioner in the generator, which provides a stabilised internal supply voltage (a wide operating voltage range of +/- 20V) to the generator, the light output, consumed power and system efficacy (efficiency) of lamp system vary by less than 2% as a result of mains voltage fluctuations. There is no noticeable effect (visual or measurable) on the colour performance (colour temperature, colour rendering, etc.) due to supply voltage fluctuation. Will INDO Induction lighting fade or damage materials? The amount of ultraviolet light generated by an 85W lamp is roughly equivalent to that of a regular fluorescent lamp per 1000 lux. The permissible exposure time (PET) is +40 hours per 1000 lux, generously above the norm (24 hours per 1000 lux). The damage factor for materials is rated at a low 0.3 so INDO Induction lamps can generally be used in open luminaires without any front glass. The INDO lamps and ballasts are separately replaceable, however, INDO Induction lights are almost always supplied as a lamp/ballast pair, even for relamping. End of life usually means the ballast must be replaced, and at the time, it is usually recommended to replace the lamp, as phosphor degeneration at 100,000 hours lowers lumen output 35% to 40%. 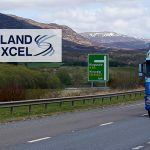 The recommended service life is 60,000 hours (6.8 years running 24/7 or 15 years running only day or night). 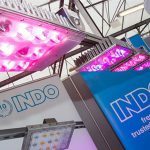 Why is INDO Induction lighting technology worth more? The INDO Induction lighting system offers five to ten times the life of HID systems for only two to three times the cost of the HID lamp and ballast. The payback in maintenance savings will more than offset any additional capital cost.